STONEHENGE COMPLETED & THE FIBONACCI CODE principally concerns three ancient monument groups built in the fourth millennium BC in north-western Europe and the Isles ; the Knowth and Newgrange mounds group in central Ireland, the less well-known Tustrup site in Djursland, Denmark and the first portion of the highly publicised Stonehenge in southern England. Knowth was constructed about 3500 BC, Newgrange followed. Both mounds were built with many large flat stones upon which petroglyphs portray number glyphs and comprehensive Sun & Moon calendars. Around 3100 BC, sophisticated arithmetic and geometry evolved in Tustrup, facts firmly demonstrated by the geometry and component parts, how its design accorded with the Fibonacci progressive arithmetic series. Created about 3100 BC, the first simple Stonehenge comprised a ring of exactly fifty-six Aubrey Hole markers, its purpose to forecast lunar eclipses. These locations were centres of metropolitan activity in the fourth millennium BC more than five thousand years ago. Three Neolithic communities exhibited their skills, shown to be closely related in several very significant and quite novel ways. This book explains the design basis of each monument and emphasises the building blocks upon which they rest. Positive evidence in stone and timber show knowledge and complex ideas were transmitted between these sea-linked peoples of the north-west. The Stonehenge made about 2300 BC we see today is a three-in-one combination of these three earlier monuments principles and techniques. Stonehenge is Sun calendar of sixteen months a year, months of four weeks and five days a week, 365 days a year. It is a Moon calendar of twelve months a year of 354 nights, six weeks a month, five nights a week including the means to forecast lunar eclipses every 18 years and 11 days. 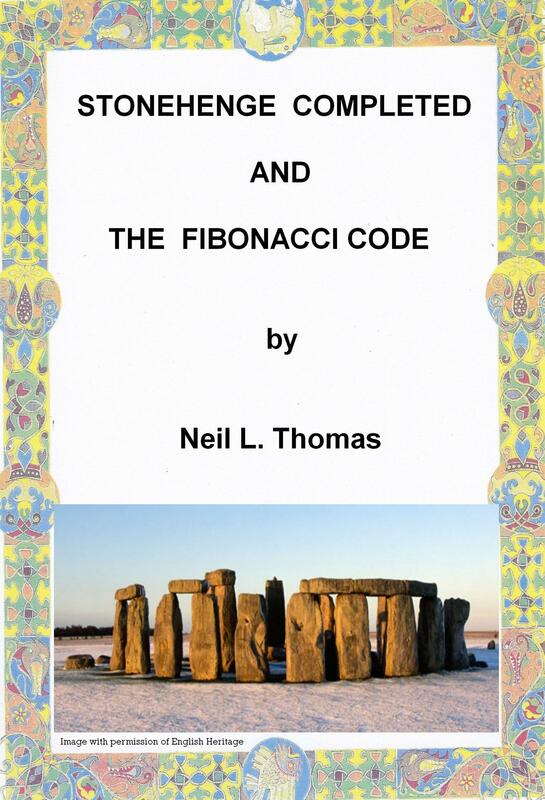 Mathematics with the Fibonacci arithmetic series 1,2,3,5,8,13,21,34,55,89 are the core of its design. The human resources and organisation needed to build Stonehenge and the many other ancient monuments of the millennia BC were founded upon an educated society and a considerable population. The assembled qualities and knowledge present at Stonehenge supported a monument embodying language, mathematics and the exchange of knowledge and ideas. The Stonehenge of c.2300 BC can rightly be termed the world’s first university. Dr Neil L Thomas, a chartered engineer in the Australian oil and gas industry, made field trips to Ireland, Wales, England, Scotland, the Netherlands, Denmark, France, the Middle East, Egypt, India, China, Canada and the USA. Years of research led to an understanding how the myths and folklore of north-west European peoples complement prehistoric monuments, the evidence fits together like a jigsaw.